I always love shopping the Union Square Farmers Market, as I end up finding produce that I’d never be able to find in a grocery store. 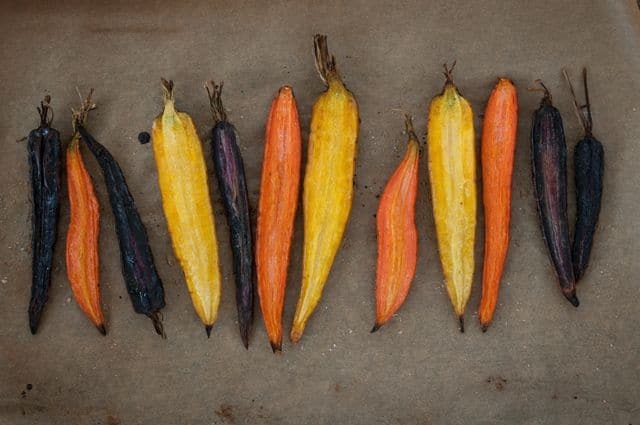 Like these colorful carrots. These purple and yellow beauties taste just like their orange sisters, but somehow elevate the dish and make for a much prettier presentation. Kind of look like candy, don’t they? These can be a great snack after school, a side dish, or even hors d’oeuvres at a party. They take less than 5 minutes to prepare, only 30 minutes to bake, and voila. 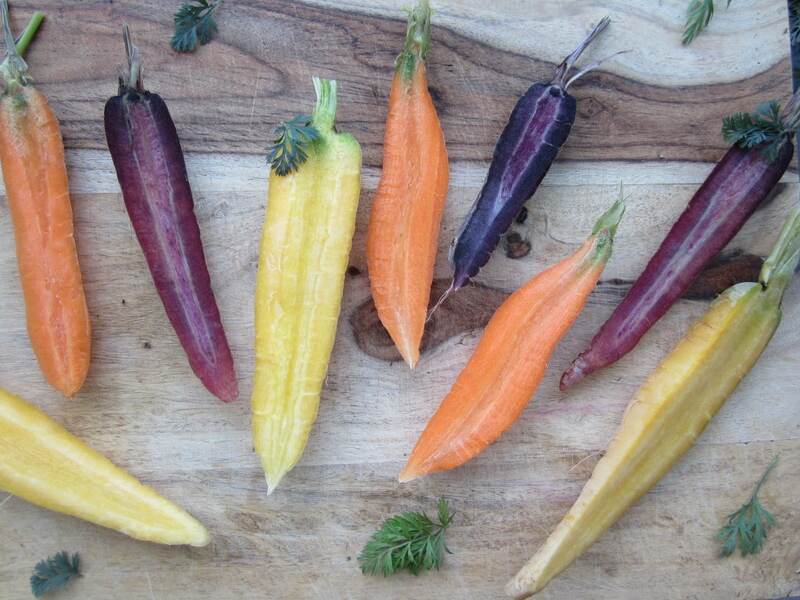 Bright, beautiful carrots that are tasty, bursting with nutrients that are easy and fun to eat with your fingers. 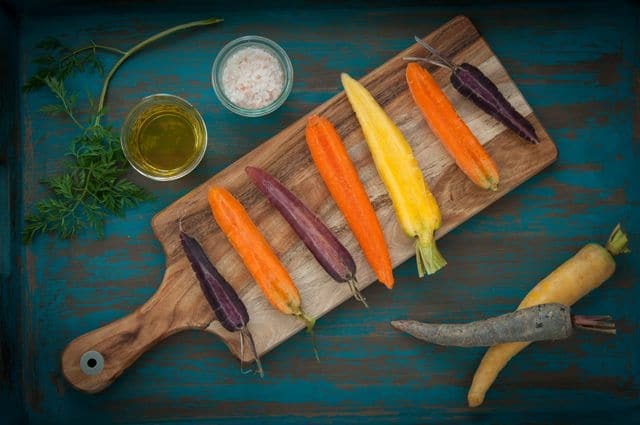 If you can’t find the small, thin, colorful variety like I used, the key is still to use small thin regular carrots, instead of those big fat juicing carrots, which won’t cook as evenly or quickly. Ideally you would find carrots with the tops still on (as they will be fresher anyway) and trim the stems off about an inch from the top. I added a little herb oil (simply minced parsley and/or cilantro mixed in oil) and crushed walnuts to make them look even more enticing, but you can serve straight from the oven if you so choose. These are so simple, yet so delish. If you make them, come back here and leave a comment below, or snap a photo and tag it with @Maria_Marlowe on Instagram so I can see it! Easy snack, side dish, or appetizer recipe. Cut the stems off the carrots, leaving about 1 inch of green on top. Slice each carrot into two equal halves, lengthwise. Brush with oil and lay out on a baking sheet. Sprinkle lightly with salt. Bake for appx. 25-30 minutes. (more for thicker carrots, less for thinner ones). Optional: Meanwhile, in a small bowl, mix fresh parsley and oil. 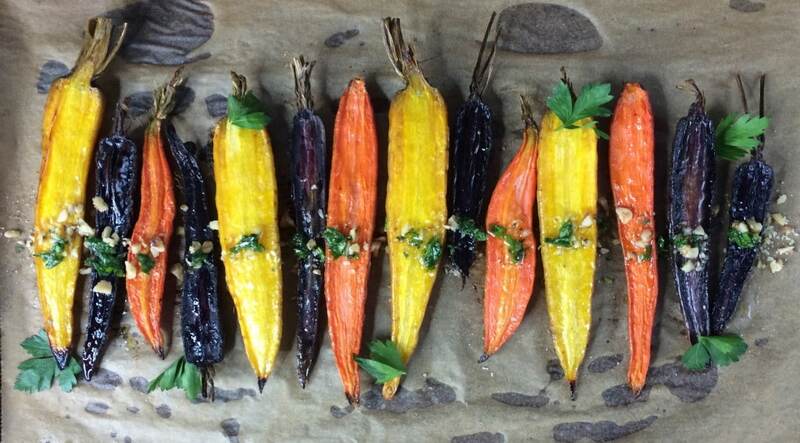 When carrots are finished baking, put them on a serving dish in a straight line, and drizzle one line of herb oil across the middle, and sprinkle with crushed walnuts. Our family grills on the deck for our pool parties during the summer, and these would be PERFECT for that!